Wharariki. 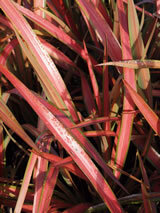 Medium perennial with glowing green-orange striped leathery erect sword like leaves. Older leaves develop a spreading drooping habit. Tall stems up to 2 metres tall produce green tinged orange or yellow flowers in spring, loved by the tuis for their abundant nectar. These are followed by pendulous twisted seed capsules. Very tolerant of many soils and conditions. Chose good fertile soil though to maintain the best colour.The colourful foliage looks great against green foliage. Grows in exposed or coastal sites. / Prefers a sunny site / Will tolerate very hard frosts. Medium, height between 0.6 and 1.5 metres. We have this currently available in a PB 6.5 container. Ask for it at your retailer.